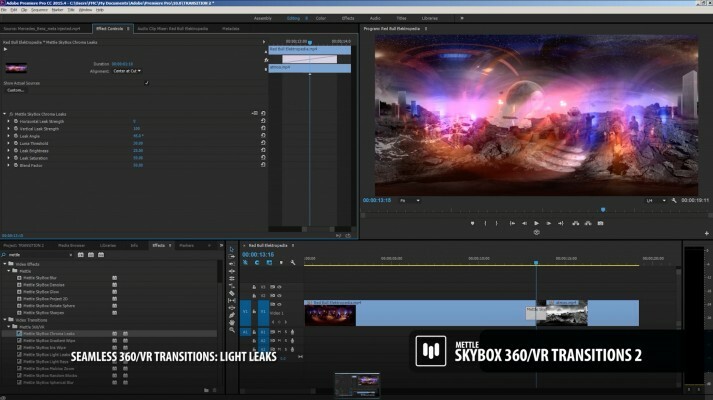 SkyBox 360/VR Transitions 2 is a pack of four seamless 360 transitions for Adobe Premiere Pro. Chroma Leaks, Light Leaks, Light Rays and Spherical Blur. Each transition has multiple features to customize and create an endless variety, designed specifically for 360 footage. SkyBox 360/VR Transitions can be applied directly on two adjoining clips of Equirectangular footage on your timeline in Premiere Pro. Designed specifically for 360 footage, the transitions properly distort the transitions to appear correctly in 360 format, with many customisable features. We support Equirectangular format, mono 2:1 or Stereo 1:1 over-under.Adobe Premiere Pro has a rich set of tools for working with transitions. This functionality is fully compatible with Mettle's 360/VR Transitions. * Fixed over-exposure in Chroma Leaks & Light Leaks in CUDA rendering.